Our 2004 Road Trip, Part 8 of 10: A Mere Taste of Canada « Midlife Crisis Crossover! Once upon a time in 2004, Anne and I got married and had a honeymoon! A week later, we (and my son) embarked on our fifth annual road trip: a drive northeast from Indianapolis up to see the watery wonders of Niagara Falls and its adjacent tourist traps. Sometimes here on MCC I don’t come out and tell you when I’m the bad guy of a given entry. I prefer to leave those realizations and judgments for You, the Viewers at Home, either to catch or to overlook on your own. Anne and I made our peace with the Canada incident long ago, but it’ll never be one of my favorites. In all our travels throughout the United States, we’ve left the country exactly once. This is the story of that one time. Between the communication breakdown, the part where I pulled a Homer Simpson, and the omen of car problems to come, it was not our best day. But at least I got some peanut brittle out of it. DAY FIVE: Thursday, July 29th. With a full night’s sleep in my system and a round of breakfast buffet downed, I walked a block to the nearest gas station and picked up some coolant to quell the warning light from the day before. I walked back to the car, popped the hood, and spent twenty minutes wrestling with the radiator cap — twisting, turning, pushing, pulling, using a rag for traction, using a floor mat for traction. Stupid thing wouldn’t budge. I stopped, took a deep breath, and said a heartfelt prayer, thankful for the good of the week yet honest about the humility experienced at the hands of a dumb stupid cheap plastic circular thingie that some dimwitted garage neanderthal somewhere back in Indiana had previously used as an outlet for his aggression. I hope I worded that last feeling a bit more diplomatically in the moment. Fifteen literal seconds later, the cap came off with ease. With the car now refilled and refueled, we gathered our driver’s licenses and my son’s birth certificate, headed back to the Niagara area, crossed the Rainbow Bridge (actual name, not a casual Thor joke), and touched down in The Canada, our first time stepping foot outside the United States, and to date our only time. In 2004 that’s all you needed to traipse back and forth from one country to the other. Entry was a twenty-minute wait during rush hour, but we were admitted with minimal scrutiny. Life three years after 9/11 wasn’t immediately harsh everywhere. Some new obstacles to The Way Things Used To Be took a few more years to come into effect. After paying for a parking spot, we walked up to a nearby booth and exchanged our American cash for some Canadian tender, just for fun. $60 American became roughly $77 Canadian. Their money is pretty and colorful and is decorated with pictures of cute animals and famous Canadians we never learned about in American school. We were ready to see what Canadian spending felt like. We then walked over to the first building in sight: one of the fabled duty-free shops. Legend has it that Canadian items can be sold without sales tax (or bought, then later subject to a refund of sales tax), on two conditions. First, you have to buy them in sufficient large quantities. We really didn’t care about the tax situation in general. The minimum expenditure for non-taxation was dozens of dollars (US or Canadian) above what we intended to spend, so it wouldn’t have applied to us. We just wanted souvenirs, taxed or otherwise. The second condition: you can buy at the duty-free shop if and only if you exit the country immediately after purchase. We were 100% unaware of the latter condition as we spent a good twenty minutes browsing and accumulating. At the register, with our pile of Canadian mementos and foodstuffs in a promising pile, then we were informed of condition #2. The cashier cheerfully offered to hold our items for us, promising to allow us to purchase them when we returned at the end of our Canadian day, asking only that we give them our license plate number for ID purposes. The car was inconveniently parked a block or two away and unavailable for visual reference. Since I never pull myself over, steal my own car, or study my own license plate with any regularity, I blanked. Today, you can bet I’ve had my current license plate number memorized for years. Then, not so much. The clerk’s smile waned, but she put the merchandise in a bag behind the counter anyway, on a shelf filled with several other bags of unclaimed merchandise, none of them possessing any identifiable markings to distinguish them from each other. I assumed that, as soon as each would-be owner left, the merchandise would be quickly redistributed back onto the shelves for purchase by some other tourist who would have their license plate number handily written on the back of their arm in case of tourism emergency. Sometimes I think things but forget to say them out loud. Or I keep them to myself, assuming they’re unnecessary because everyone else around me is thinking what I’m thinking. This was one of those times. A bit irked at our delayed shopping gratification, we exited and walked along the Canadian side of the Niagara River for a good mile or more. We appreciated that the American half of the Falls are much more head-on visible from the Canadian riverside. 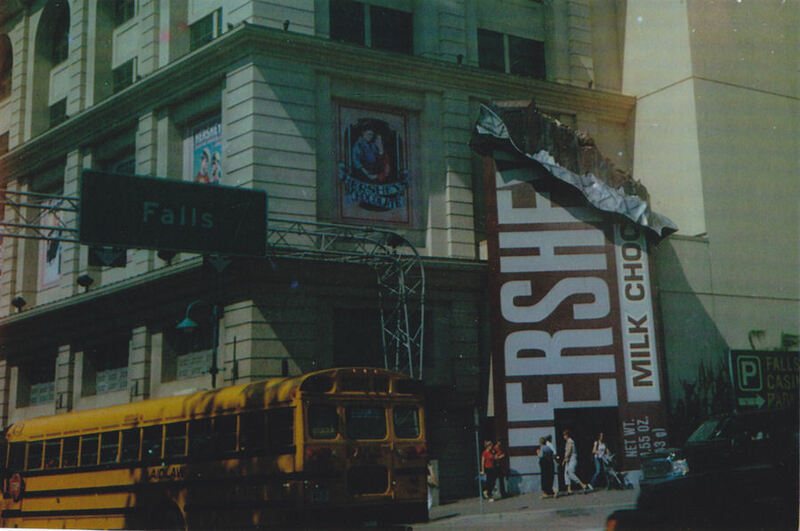 We didn’t take photos because we were saving our remaining rolls of film for later, and because we’d more than covered the Falls at previous attractions. We perused a few souvenir shops and replaced a few of the items we’d intended to buy at the duty-free shop. We noted the frequent use of English and French in equal measures, and the quaint metric system on much of the signage. I was intrigued by a Canadian food item called the Nestle Coffee Crisp bar, which was sorely lacking from American checkout-lane shelves. I also caught my first glimpse of an Aero bar, which a Canadian message-board compadre had described to me at length in a recent thread. We Americans scoffed at him at the time, but as always, that fine Canadian citizen who posted under the sobriquet “Filthy Jawa” was on the level. What we noticed most about the Canadian riverside is that some of it is, well, tacky. We liked the copious trees, the clean streets, and the fabulous stone structures. Less overwhelming were the assorted tourist traps stacked upon each other, the tall and garish hotels, the Ripley’s Believe It or Not Museum, and the numerous casinos. Parts of it resembled Vegas with a neon shortage. We presume these unsightly man-made blemishes are the exception in Canadian scenery rather than the rule, despite the enormity of said eyesores. It’s not as though the American side was free of eyesores. In future years at road-trip stops in San Antonio, Wisconsin Dells, and Virginia Beach, we’d come to realize such sideshow gaudiness wasn’t strictly a Niagara Falls phenomenon. After wearing ourselves down from so much early walking, we returned to the car and drove to our ultimate Canadian destination, which we’ll return to in Part 9, which will fit neatly right about here and contain five times as many photos. The advance TL;DR version of that chapter: we saw neat animals, a few of which seemed out of place, and added at least another mile or two of walking to our already strenuous day, the last full day of our vacation. The rains were long gone, chased away by July sunshine that threatened to broil us in our own sweat. 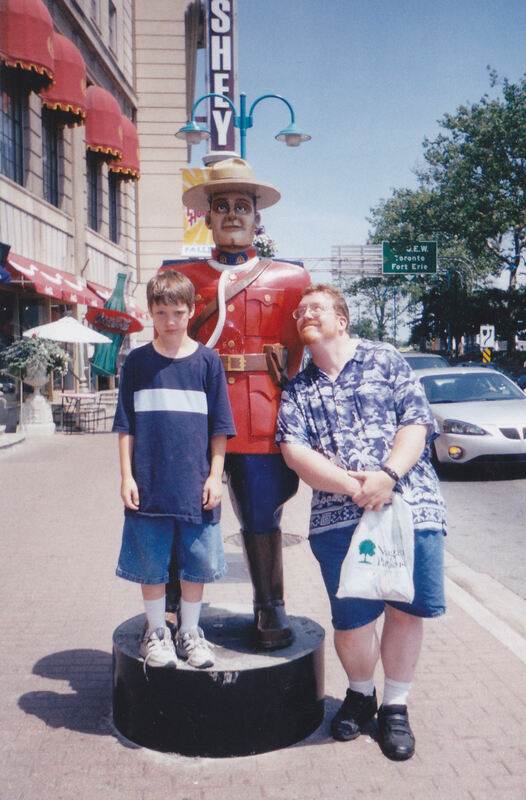 Our final Canadian stop of 2004, and to date, was the same duty-free store by the Rainbow Bridge. Rather than walking to the store, this time we were sensible enough to park in their free lot, though the signs insisted we had a time limit, which was why I didn’t park there the first time around. A greeter stationed at the lot entrance asked us if this would be our last stop in Canada before returning to the US. Confirming our nationality and our intentions, the greeter welcomed us into the lot, with the warning that we would need to memorize our license plate number if we wanted to make any purchases in the store. The duty-free store had had no such greeters for pedestrians when we’d walked up earlier. We could’ve avoided our polite misunderstanding earlier if we’d been spotted and accosted before entering and cluelessly getting shot down by the cashier. The three of us gave the store one last listless, cursory browse. It was mostly filled with perfumes, liquor, and candies, so held little fascination for us beyond the candies and the standard souvenirs, of which we’d already recouped a portion of our losses at other shops. I picked up a bag of peanut brittle, paid for it, gave my now-memorized license plate number as requested, and was told we could drive around back to pick up my one purchase on our way back to the Rainbow Bridge. Anne hadn’t found anything else she wanted beyond what she and my son had picked out on their previous visit. At that moment, right in front of the cashier while buying my brittle, I told her that I’d written it off and that they’d probably put all the items back on the shelves after we left. I figured they knew that. Somehow I never saw that critical Homer-and-Marge moment stealthily approaching until it exploded in my face. Several minutes of uncomfortable non-pleasantries followed that shall not be recounted in depth here, mostly because thirteen years later some self-defensive part of my brain that would rather not relive that part has rendered them a blur. But it ended with Anne embarrassed and giving up, not remotely interested in going back through the entire shop to select everything again. We eventually walked outside and drove around back. I sheepishly fetched my cheap brittle from the pickup window and drove us off the store lot through the only allowable exit, a path that led directly out of Canada without allowance for turnaround or saving the day through penitent last-minute re-shopping. We returned to the hotel and allowed time for all of us to cool off, literally and otherwise. When we all began speaking to each other again, we discovered we shared one remaining goal in common: a decent dinner. We all piled back into the car and, having nearly exhausted the outlying region, pointed the car westward, the sole remaining unexplored compass direction from the hotel. Whether this was divine providence or a hilarious punchline that had been patiently waiting to happen, after days of struggling to find decent places to eat, that particular road was littered up one side and down the other with restaurants galore. Back in the days before we had either a laptop or smartphones, we’d had no good way to locate things through onsite research. Stumbling across surprise businesses was how we rolled. One establishment rose above all the rest in my mind based on what I’d gleaned from previous internet chats. There it stood, shining and beckoning: Fuddruckers. If you’ve never tried one, it’s a burger joint with fancy touches, similar to a now-defunct Indiana restaurant chain called Flakey Jake’s, which I also once held in high regard. You order your food cafeteria-line style, sit and wait for it to be prepared, go fetch your generous portions of food when your name is called, and take advantage of their extensive toppings bar, comprising dozens of different sandwich condiments and accessories. It’s simple yet glorious. We went to bed on full stomachs. It may have been bad for digestion, but it was ideal for recuperation, for restoring our lost good moods, and for recharging our energies to face the challenging drive home.